Posted February 15, 2013 by Gruber Photographers & filed under Weddings. A New York City Wedding put together one piece at a time. A bride knows what her wedding will look like long before her wedding, and in many cases, long before she even becomes engaged. It’s upon engagement when all of the details can start to come to life, almost like a puzzle: piece by piece everything fits into place. 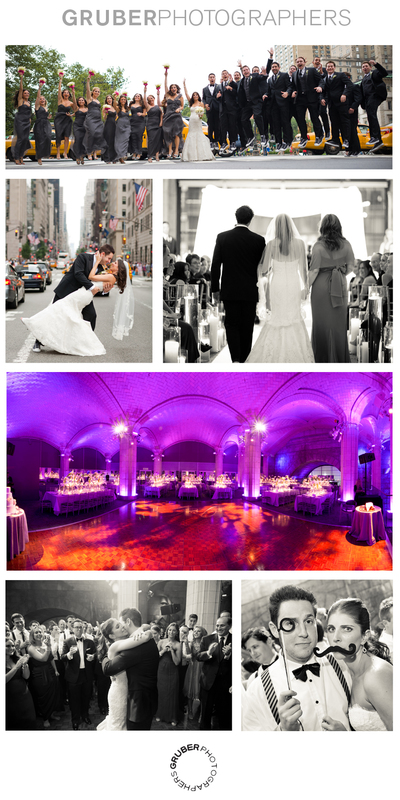 While I am a traditional girl at heart, for my wedding I wanted something other than traditional, so after Jeremy’s proposal in late October 2011 with the help of the amazingly talented Vicki Dubin and Victoria Dubin Events, we found our venue: Guastavino’s, located underneath the Queensboro Bridge. New York City has a personality all its own and it was important for us to capture the real character of the city as well as that of Jeremy and me. Not only was the space truly beautiful, with intricate stone arches and pillars, it had a special significance: seven years ago it was a restaurant and it was at that restaurant that Jeremy met my parents for the first time. With a venue that spoke for itself and boasted the clean lines and geometrics of The City, we wanted to find a photographer who was able to highlight our special day more as a documentary telling a story, rather than simply taking pictures. Our final corner puzzle piece was put in place when we found the wonderful Jeremy Saladyga and team from Gruber Photographers. From the moment my Jeremy and I met Jeremy Saladyga, we were comfortable. He has a way about him that is warm and welcoming and in our eyes, he just “got it.” He knew exactly the kind of NYC summer wedding photographs we desired, and he delivered them in a beautiful manner, all the while making the process seem effortless. With the incredible talents of Marianne Bennett Productions, Jeremy and I danced our first dance as husband and wife to Precious Love by James Morrison and then our families, our eleven bridesmaids, ten groomsmen (all outfitted in black Chuck Taylor for Converse sneakers) and all of our guests danced into the early hours of the morning in the most beautiful room (by Bob and Kathleen at Ed Libby & Co.) filled with orchids and calla lilies and shades of silver with pops of color throughout. Our wedding was a true celebration, not just of us, but of happiness, of love, of family and of friends, all of whom helped to make this the most special, memorable day of our lives and everything we could have ever dreamed of: a complete puzzle.